My friend Rich Grassi is a retired cop, a masterful instructor, and one of the best writers in the tactical field today. He recently wrote that it would be wise to carry a gun all the time, given the spate of terroristic mass murders in this country and elsewhere. Someone wrote back that the likelihood of being able to stop such a thing was less than that of winning the lottery. The critic simply didn’t get it. Someone is going to win every lottery. More mass murder attempts are going to happen in this country. The more good people who are in place armed and ready to stop it, the less the toll of death and maiming and tragedy is going to be. Yes, it is that simple. A good friend of mine, Jeff Chudwin, is a retired police chief and internationally recognized master of tactics. Here are just a few recent incidents Jeff has passed along, drawn largely from the national Israeli intelligence provider, DEBKA. The list goes on. Let’s look at some obvious lessons. First, the above list did not take years to accumulate. These incidents piled up within days of one another. While the problem is certainly chronic, it is also acute and increasing in its intensity. Second, look at how many of these were swiftly cut short as soon as even one of the proverbial “good guys with guns” were able to make their presence felt. Third, notice that when “good people with guns” were not present, the terrorists inflicted horrible injuries until they got tired of doing so. 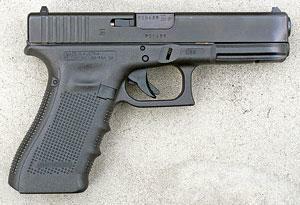 A Glock 22 in the hands of armed citizen Nick Meli stopped a mass murder without firing a shot, just days before the Sandy Hook atrocity, where no armed citizens were present. The gun prohibitionists here in the States decry the armed citizen concept, claiming that “untrained civilians” will open fire wildly hoping to stop the mass-murderer and kill each other. The following is worth saying in all caps: NOTHING LIKE THAT HAS OCCURRED IN THE UNITED STATES, EVER! 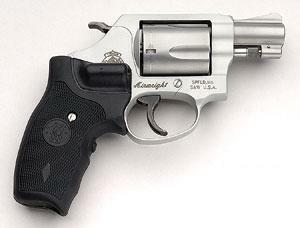 A snub-nose .38 (like this S&W 637 Airweight) in the hands of armed citizen Charl van Wyk, drove off a heavily-armed terrorist band in Cape Town, South Africa. This specimen is equipped with Crimson Trace LaserGrip sighting unit, a useful thing in, say, a darkened theater. Here in the US, another danger became apparent in June of 2014. A whacko far-right couple assassinated police officers Alyn Beck and Igor Soldo, who were having lunch in a pizza joint, then ran into a nearby WalMart where the male fired a shot into the ceiling and cried out, “The revolution has begun.” Joseph Wilcox, an armed citizen with a gun permit, drew his 9mm Glock and followed the male suspect, but the female suspect who had lagged behind the male unseen approached the Good Samaritan from behind and shot him dead. The murderous couple died minutes later in a gunfight with responding LVMPD officers. Practice shooting from behind cover. Here, the author is using the support beam to replicate the corner of a heavy wall. In America, as in Israel, there have been cases where armed citizens have prevented mass murder. 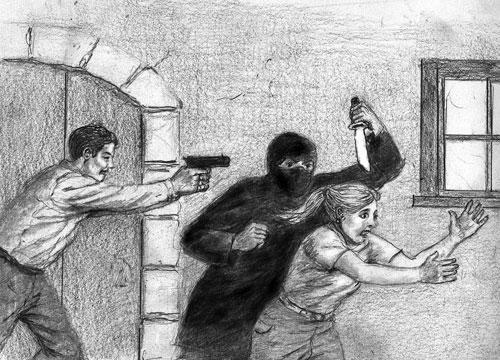 In Israel several years ago, a housewife in a marketplace saw a man about to detonate a bomb vest; before he could do so, she drew her concealed handgun and shot him dead. In the Clackamas Mall in Oregon within days of the Sandy Hook atrocity some 3,000 miles away, a man opened fire with an AR15. A 22-year-old man with a concealed carry permit, Nick Meli, drew down on him with a Glock .40, and the killer broke off his attack. He fled through an “employee only” door, ran down a hallway, and killed himself, his deadly mission totally aborted by a good citizen who never had to fire a shot. But how many remember a mass murder aborted less than three months before in the same state, on April 22 of that year in Denver? That particular murderer opened fire at the New Destiny Church, and was only able to claim one victim" the pastor’s mother" before an armed parishioner drew his own legally-concealed handgun and shot the killer dead. It was estimated that 30 or more lives were saved when that particular killer was shortstopped. And, speaking of church shootings in Colorado: a few years earlier, a madman burst into the New Life Church in Colorado Springs, firing as he came. Volunteer church security member Jeanne Assam ran toward him, firing her Beretta 9mm as she went, and cut him down with so many bullet wounds he was only able to fire one more shot … into himself. Jeanne Assam was credited with saving as many as a hundred lives that day. Nick Meli was a private citizen when he stopped the Clackamas Mall spree. Antonio Milow was an off-duty cop when he killed the killer in Denver and halted the victim toll at one. Jeanne Assam was a former cop, now an armed citizen, when she cut down the murderer in Colorado Springs. It doesn’t matter whether “the good guy (or gal)” is carrying on a celluloid card that says “law enforcement officer” or “concealed carry permit.” What matters is that the good guy or gal is there with the wherewithal " a gun, a skilled hand, and the fortitude " to stop the murders. Capability of accurate shooting will be critical in such a situation. 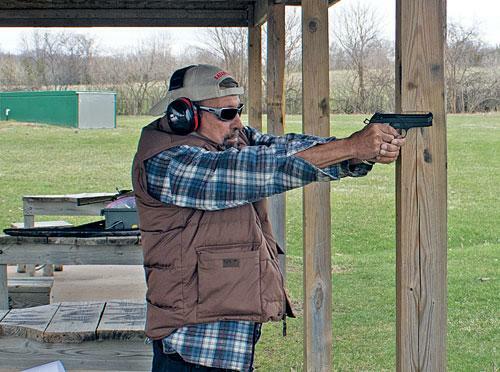 Here, fast brain-shot-size groups are practiced from 15 yards with Wilson Combat Beretta Compact Carry 9mm pistol. Some suggestions if you are caught up in such an incident, and are capable of using a gun to stop it: Don’t draw your gun until you have absolutely, certainly identified your target, and are ready to apply force. In all the predictable tumult, you don’t know what other good guys and gals are turning to see what they can do to stop it. They’ve heard the shots and screams, they see you, an unidentifiable person with a gun … and they may jump to the wrong conclusion. And, if the killer has an as-yet-unseen partner, you could end up like the martyred hero Joseph Wilcox in Las Vegas. In the same vein, once you have the killer down, holster as soon as possible. You don’t know if other good folks, including arriving officers, have come in knowing someone is killing the innocent, and has just seen “unidentifiable you” gun down a man they don’t realize is the real danger. 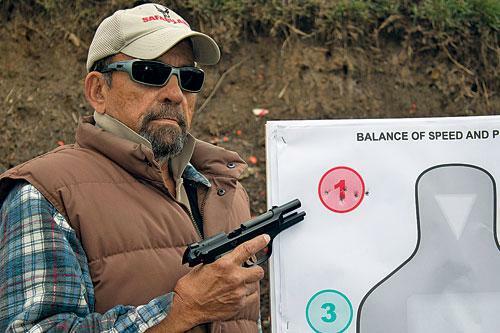 Minimizing the possibility of a mistaken identity shooting on either side of your gun is imperative. Understand that marksmanship skill will be critical! The scenario is likely to contain multiple, panicking, running, innocent people. More and more, police are training to go for brain shots on terrorists. They may be wearing “bomb vests” that can be detonated by a bullet’s impact, killing or maiming every innocent victim within a radius of many yards of the wearer. They may also be wearing bullet-resistant vests. In Tyler, Texas, some years ago, heroic armed citizen Mark Wilson stopped a mass murder at a courthouse when he shot down the AK-wielding gunman. However, his bullets had stopped on the murderer’s concealed ballistic vest, and while Wilson was reloading, he was killed when the gunman jumped back up and shot him. The killer fled, and was subsequently slain by a heroic Tyler cop, Rusty Jacks, whose hand I am proud to say I was later able to shake in congratulation. Another rationale for the brain shot was seen in a recent case in Israel, which you can find on Google or YouTube. Security cameras caught the jihadi using his car to run up on the sidewalk and crush a rabbi to death, and then jump out of the vehicle and begin stabbing. An armed citizen shot him down. He jumped back up, was shot down again, and then it happened again. Two lessons: a brain shot keeps killers down, and the 9mm full metal ammunition believed to have been used in that incident is notorious for poor “stopping power.” Have your handgun loaded with hollow points: they’re distinctly more dynamic on body shots, and also less likely to ricochet off a human skull and be deflected from their underlying target. With all those bystanders in mind, be prepared to drop to kneeling or a deep crouch when you fire, so a bullet that misses or over-penetrates the killer is more likely to pass over the heads of anyone behind him. And, as always, take the best cover you can. Whether he’s dispensing bullets or bombs, you’re in the path of the killer’s destruction. Any of us is unlikely to be the person in place to stop a mass murder, whether the event was triggered by psychosis or religious fanaticism. But no one who ever faced it thought it was going to happen that day, either. The senior citizen traffic cop who used his Glock .45 service pistol to drop two carbine-armed jihadis in Garland, Texas, before they could kill any of their intended victims … Charl van Wyk, the armed citizen who used a snub-nose 5-shot .38 to engage four terrorists armed with machine guns and hand grenades and cut short the massacre at the St. James Church in Cape Town, South Africa in 1993 … and all the too-many-to-name-here “good guys with guns” who have stopped mass murders, didn’t think it would happen on that day, either. It’s not about the odds, it’s about the stakes. You, who by choice are reading a magazine dedicated to self-reliance, don’t need me to tell you that. But there are people in your lives" and people who make the laws that guide our lives in this country" who need you to tell them these proven facts.